1-ton Harrington electric chain hoist with Spider-Lift™ bulk bag lifting frame. 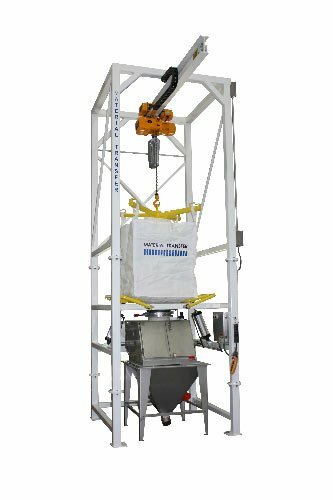 Flo-Master™ bulk bag massaging system with tubular frames break up clumps and promote material flow. 304 stainless steel bulk bag support pan increases bag stability and operator safety. Bottom of bulk bag support pan includes a manual iris valve to control material flow. 304 stainless steel bag break station with dust hood, two hinged access doors, and interlock switch. Dust hood includes a removable tube with spout access door for bulk bag discharge spout access. Hood includes a custom dust manifold with twin removable filter cartridges, and a rear mounted blower with 2 HP TEFC motor. Bag break station dust hood mates to a 304 stainless steel conveyor inlet hopper. Unit features a Hoffman NEMA 4X system control panel.